Almost every woman asks the question, what drugs to use when washing clothes to make it spotlessly clean and dazzling white? If remove stains will help washing powder, to obtain a boil-and-white things, you can use different methods and tools. In pursuit of a white color of things you can use the old "grandma's" method – boiling. To do this, put a big bucket of water on the stove (if the glass ceramic hob, do not exceed the weight load of the slab). Dissolve in a bucket of the powder for hand washing and put ashen linen. Simmer for 30-40 minutes, stirring occasionally linen. Cooled down a bit put linen in the washing machine, rinse and wring in it. This method is suitable only for white clothes made of natural fabrics. Usually it's bed linen, children's underwear, kitchen towels. More gentle way is soaking the clothes before washing. On 12 liters of water, put 8 tablespoons of salt, 50 g of washing powder, 3 l of 3% hydrogen peroxide and 20 ml of hydrogen peroxide. Let items soak in warm water for 4 hours in this solution. Then thoroughly rinse. This soaking will return the white stuff made of wool and silk. For whitening things from guipure fabric and tulle, place in a bowl of water 2 tablespoons of hydrogen peroxide and 1 tablespoon of ammonia. Soak for 30 minutes and then rinse. One of the simple ways to return things snow white is the use of bleach. When washing in the washing machine to powder, add the powder bleach & washing powder. If you bought a bleach in liquid form, paste it into the compartment for pre-wash. Carefully read the instructions for use of this tool, it indicates for what type of fabric is used, the bleach, the temperature regime in which it is used and the dosage. 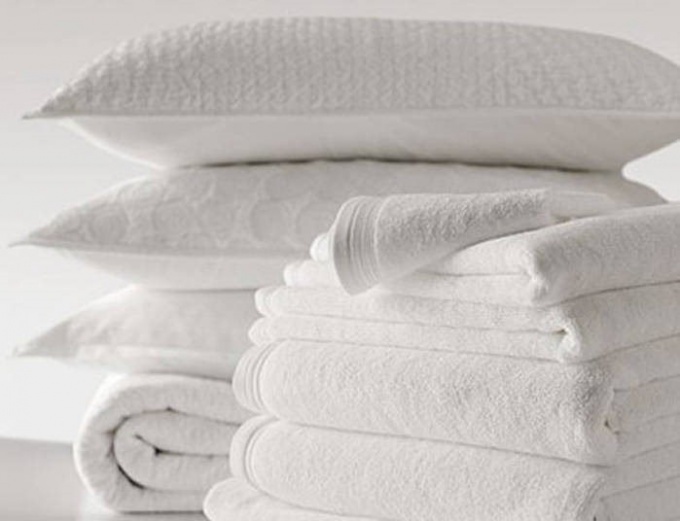 Be sure to wash white items separately from light as cotton and linen clothing separately from synthetic and silk. In this case, after washing the white things are not becomes gray. White clothing looks neat and elegant. Only trouble is, it was too easily soiled. One random spot can destroy her forever. Therefore, whites need not only the Laundry but also in the periodic whitening. Not every white thing can be subjected to ordinary bleach. This is especially true of products made of artificial fabrics, so before you start the washing white clothes, look at the fabric composition. The easiest way bleached products made of natural fabrics – linen, cotton. Soak them in ordinary soapy water with a small addition of ammonia, about 5 tablespoons per 10 liters of water. Alcohol eliminates magnesium salt, giving things a yellowish tinge. For particularly stubborn stains, you can try to influence ordinary household White or any other bleach-based bleach. But be careful, White contributes to the decay of things, so don't use it too often. Artificial fabric do not expose to bleach them, they turn yellow and permanently sereyut. Return the white color will help them soak all in the same soap solution with ammonia, but add in a bowl and 2 tablespoons of hydrogen peroxide. The peroxide will react with water pollution and is literally in half an hour you will get a dazzling white linen. Never wash whites and coloreds together, it hurts both. The more that modern washing powders industry has long been releasing special detergent for white linen, consisting of additives that promote the whitening and the light of their podsinivanija. Even our grandmothers knew that blue takes away from things a yellow hue, as a result they become even whiter. If the machine accidentally got pink or yellow thing and painted white favorite clothes, do not despair. Most likely underwear can still be saved. Look for a special swipe, catching and absorbing the faded paint with ruined clothes. Just run the wash for one cycle along with a napkin, things will once again Shine white. 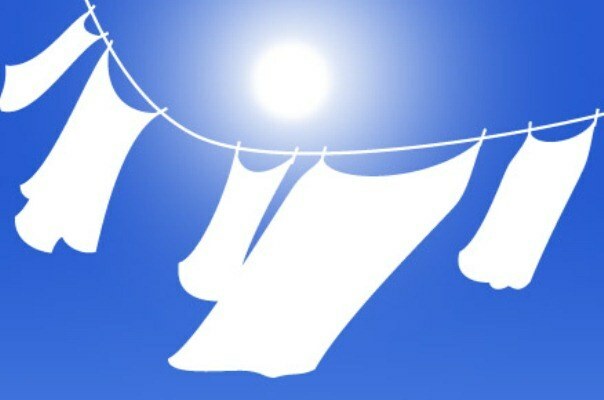 If you have the opportunity to dry clothes under the sun, use it, the sun's rays perfectly bleached things. 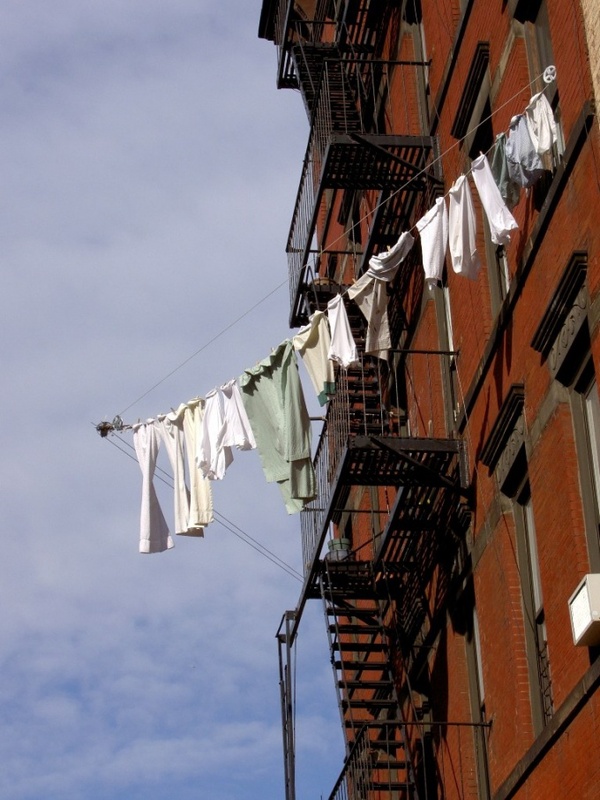 After several washes clothes can lose the whiteness. The reason for this is that in the detergent composition there are substances that interact with salts, dissolved in hard water, form compounds deposited on the linen, forming a yellow or gray powder. This lingerie looks untidy to return him to the original white, linen must be bleached. A great tool to make white washed linen – podsinivanija. The best blue is ultramarine. Powder ultramarine tie up in a handkerchief or any piece of loose matter and dip it in the water, which will acquire a bluish tint. Immerse the linen into the solution of Indigo, and then remove, squeeze and air dry. There are a large number of powders which advertising promises the whitening of linen. But most often in the composition of detergents comprises an optical whiteners. Such substances absorb light rays and reflect them in the blue and violet spectrum, giving the underwear an optical effect of white. But such funds are not under force to remove spots and heavy soiling, you need to use special preparations. You can buy ready-made bleach, thus be sure to carefully read the instructions for use and follow all recommendations. Increasing the dose means can cause damage to tissue. First dissolve the required amount of bleach in water and then put in a container with this solution linen. Particles of undiluted bleach, getting on the fabric can burn it. Good bleaching properties of hydrogen peroxide, 3-s ' solution of which is sold in any pharmacy. To whiten linen you need in an enamel or aluminum cookware. 5 liters of water take 2 tablespoons of hydrogen peroxide, heat the solution to 60-80° and lower back wash to dry for 15-20 minutes. In this way a well-bleached cotton and linen fabrics. For uniform whitening, mix thoroughly linen. If you want to achieve a better effect, add in a solution of a tablespoon of ammonia. Woolen and silk items, it is also possible to bleachusing hydrogen peroxide and ammonia. Thus for the preparation of the bleaching solution per 5 liters of water also add 2 tbsp of peroxide and 1 tbsp. of ammonia, but the water temperature should not exceed 30-35°. After whitening, rinse the items in warm, then in cold water. Do not use bleach in order to wash off rust stains, otherwise dissolving, rust will give a linen of yellow color, which is then unable to print anything. Do not bleach linen too often. The active ingredients of the bleach and also corrode the fibers of the fabric, reducing its strength and reducing the period of use. 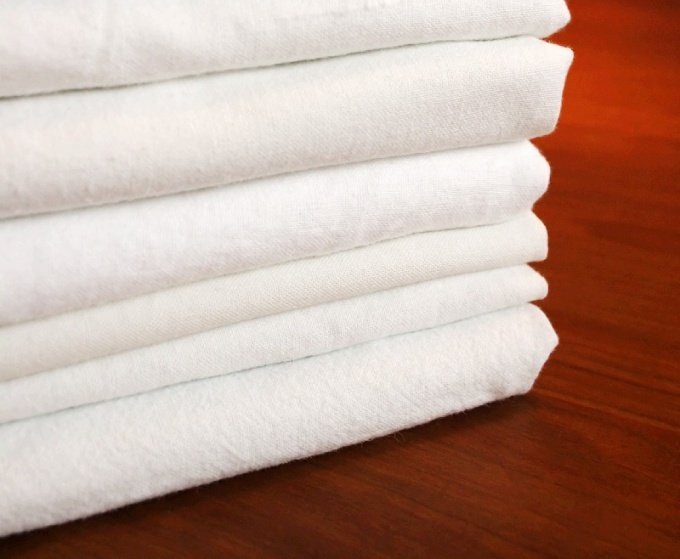 Unfortunately, to preserve the pristine, fresh white linen is quite difficult. Even in the conditions of oversaturation of the market of various chemical products designed to facilitate this task, the hostesses are constantly looking for the most effective ways of washing and bleaching. 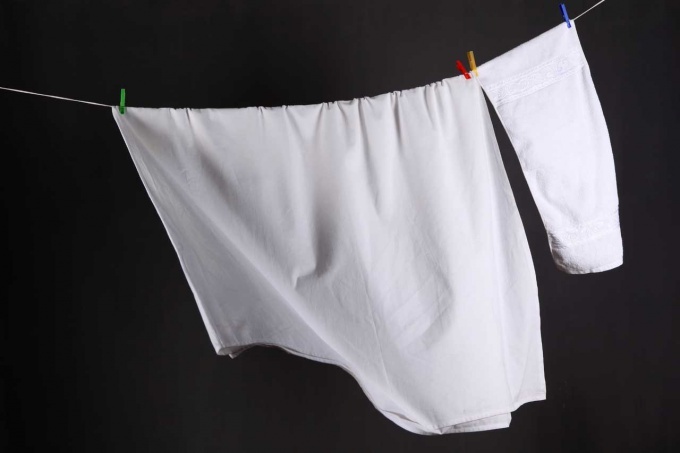 When washing you should consider the quality of the fabric from which made your underwear. Delicate fabrics should be washed at a lower temperature of water, connecting a weak spin, etc., and denser can be subjected to intense attack. Therefore, separating whites from colors, it is recommended to divide it by the density. Synthetic and wool fabric should not be washed together with linen and cotton, because then you get the grey linen, besides, and not "pellets". Undertaking the Laundry the white stuff, you still should not underestimate the achievements of the chemical industry. Correctly using powders and bleaches (and for this you should carefully read the accompanying information), you have no extra efforts not only to wash most of the dirt, but also improve the color of products. Put in the washing machine is not only Laundry detergent, but his amplifiers as well as special formulations for whitening, which refreshes the color and gives it a dazzling white shade. Many of the problems with washing white linen (grey plaque, yellow stains) can be avoided if pre-hisurinete. Leave for a few hours the white stuff in a soap solution and a significant portion of the dirt will easily wash out. By the way, by soaking the linen try to dissolve the powder, so as not to add to the fabric and other spots. But if traditional means are somehow not solved the problem, you can try to bleach linen and folk remedies. For example, soak the linen for 4-6 hours in water with nutritional yeast. Or Laundry pre-soak your stuff in water, after adding the lemon juice. Linen from flax and cotton soaked, adding to the water a few tablespoons of turpentine. Also, things are easier to wash out if them for a couple of hours to soak in water with addition of 1-2 tablespoons of boric acid. You can soak in potassium permanganate. To do this, pour into two five-liter bowl of very hot water. In one of them astrogate a quarter of a bar of soap, and in another place a few crystals of potassium permanganate (solution should acquire a bright red color). Then the two solutions mix, lather, and soak the linen. After 8 hours rinse the linen in cold water. A good result can be obtained by using and so the "old" way, as boiling. But you should know that this heat treatment allowed to put only underwear made of thick fabric, for example linen, cotton or calico. For boiling take a large metal container on the bottom of which lay something white, then put all that you are going to whiten, and fill it with water with dissolved detergent. Boil need no more than 30-40 minutes from the moment of boiling water, and important to make sure that linen was always covered with water (it floats). After boiling the clothes should be rinsed in warm water and then in cold and dry. Often, when the finishing work is required to whiten wood. Typically, this is done in order to paint went on it exactly, but the color is not distorted. In addition, the natural wood has stains, you can hide them by bleaching. Please choose the appropriate bleaching agent. Often use bleach, oxalic acid, hydrogen peroxide or a peroxide of titanium. It only works with complex compositions, and this is justified because the mixture is much faster to penetrate into the fibers and remove the pigment. Treat the surface of the Board 20%-s ' solution of sodium hydrosulfite. Leave for a period of not more than a day and cover with a layer of a solution of oxalic acid. After 5 minutes the acid must be washed off with water. 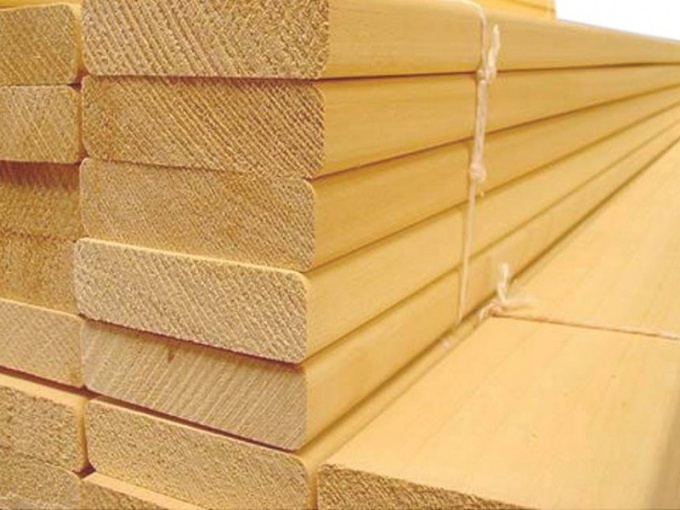 Cleans the surface of the wood after the bleaching treatment, raises the NAP and removes resin the following composition of 15 grams of chloride of lime, 30 grams of soda ash, dissolved per 100 grams of water. To prepare such a composition can be on their own. Dissolve in warm water right amount of baking soda, let cool and add bleach. After treatment with this solution the wood is again washed with water. Effective discolor wood 30% solution of hydrogen peroxide. Before applying this solution, DAB the surface with hot water, dry and proceed with the processing of a 10% solution of ammonia. Remarkably whitens the wood of deciduous breeds and highlights the wood texture milk of lime. To get it, you need 10 grams of baking soda and 80 g of bleach diluted in 350 g of water and hold the mixture in the dark for about two days. For enhanced and rapid whitening can be used the following composition: 20 g of sulfuric acid, 15 g of oxalic acid – 15, 25 g of sodium peroxide (or hydrogen peroxide -10 g) dilute to 1 liter. When working with the composition, use caution. Work in a hazmat suit, rubber gloves and a respirator. Shallow bleaching produce a composition of 40 g of potassium carbonate, 150 g of chlorine, 1000 g of water. Apply the mixture to the wood in the course of the fibers with a wide brush or roller and leave for 10-15 minutes. Wash a small area of the wood and evaluate the results. If the color of the wood you are satisfied, rinse the Board with water. For discoloration, use citric or acetic acid, previously diluted with water at the rate of 50 g acid per 1 liter of water. The wood of some species in the bleaching becomes sometimes the most incredible shades of color. To give linen a fresh new look, update it with modern detergents, for example bleaching agents for fabrics. They are mostly found in any store, only it is necessary not to make a mistake and choose the most effective. Bleaches are chlorine-based and active oxygen. Chlorine-based products known to the consumer for a long time, in their base is sodium hypochlorite. The big advantage of these bleaches is their reasonable price, great selection, they are effectively bleached linen and disinfect it. Unfortunately, constantly use chlorine-based products, they are very aggressive and can eventually destroy the tissue fibers. Fabric can not only lose their appearance, but tear. Thus, for delicate items, chlorine bleach will not work at all. Bleach with oxygen is designed to be more gentle and delicate fabrics. They can be used for washing coloured articles, at the same time to refresh their color. The big advantage is their efficiency at a temperature of 30-40 degrees, a full environmentally friendly and hypoallergenic. From bleach with chlorine, they are distinguished by a higher price. Very popular among Russian women is the bleach "Barefoot plus", it contains no chorus and is pretty cheap. The tool copes with stains, refreshes the color of the fabric, bleaches, removes odors from linen, disinfects and saves washing powder. Famous Vanish Oxi Action - less effective bleaching agent. He washes even the most inveterate stains, pre-soaking is not required. Consumers say a convenient and colorful package design, and pink measuring spoon many people like. Only here the price of the bleach very bite, still "Vanish" - the tool is not cheap. The Amway company has provided to the market a universal bleach which is suitable for all fabric types, even the most delicate – SA8, very simple and short form media. Bleach contains no chlorine components, suitable for colored fabrics, rinse well with things, leaves them on Deposit. This is a very concentrated, so economical in use. SA8 removes the problematic and very long-standing spot. The only drawback is the price of bleach, which is several times higher than even "Vanish". Bleaching agent to work more effectively, you must comply with all instructions for use are included on the packaging. And the powder, which is used together with bleach to save is not recommended.